I digress. 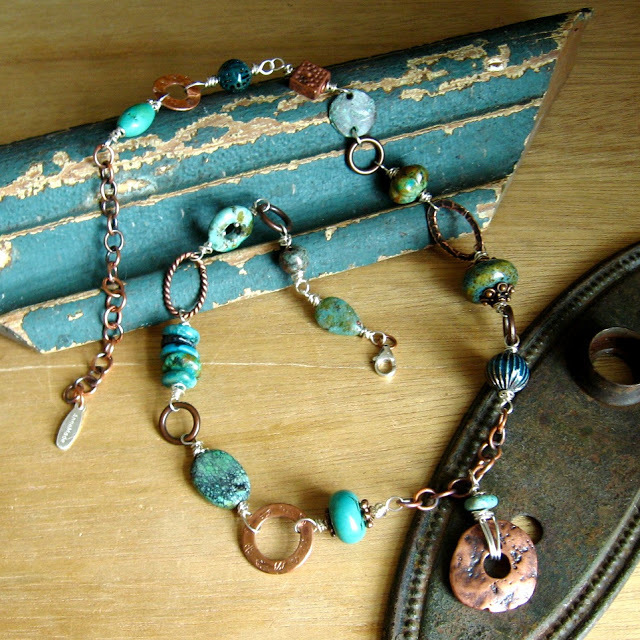 I’m on a turquoise-copper-silver kick right now, so the latest addition to my Sedona line is this necklace. 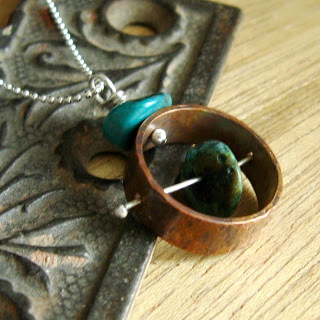 It started with this pendant, which is a section of copper water pipe with a nugget of turquoise pinned on silver wire. Pinning, in this case, is using a torch to ball the end of a wire, trapping something on it. If you use a lame torch like the one on my bench that is really meant for caramelizing the top of crème brûlée, you might burn your stone before balling the wire. Not that that ever happens to me. (Note to self: Get the oxy/acetaline Little Torch out of the shed because it would be awesome at pinning.) 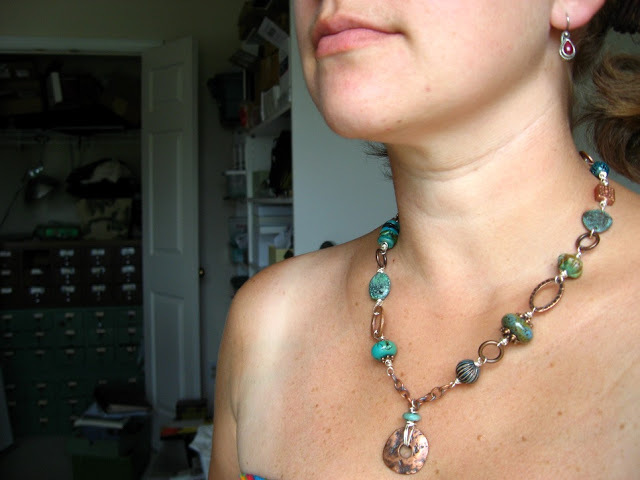 I have a habit of losing interest in a necklace once I finish the pendant, and then I just stick it on a chain and call a day. Either that or my kids wake up from their naps and my creative streak is curtailed. Anyway, I thought this pinned pipe pendant deserved something more than a chain, something more artful and creative, so I created the sampler necklace. But then it became so busy and visually heavy that the pendant was better off being showcased on a chain. And so I made a different pendant, slightly larger and plainer, for the sampler.